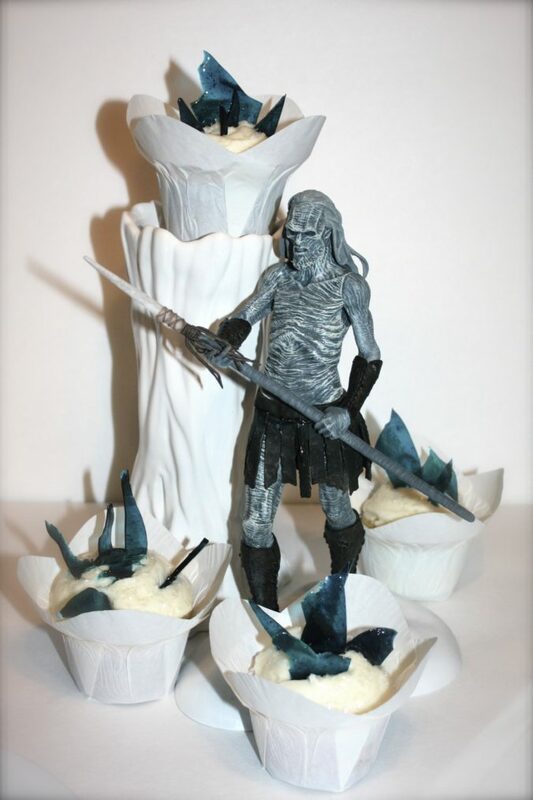 To help you get through the Long Night after last night’s episode of Game of Thrones, we suggest you try a little… vodka, in cupcake form. Deadly, but beautiful- these otherworldly cupcakes are laced with vodka and gleaming with peppermint candy ice. 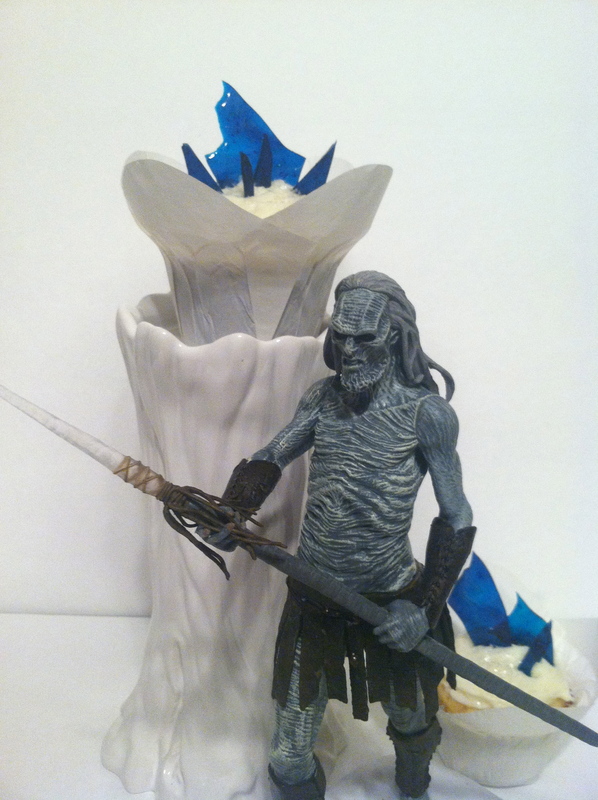 Sharp and sweet, they are the perfect way to face your fear of ice zombies. Vanilla cupcakes. Made from your favorite homemade recipe or from a cake mix following the instructions on the box. White decorating sugar to decorate the finished cupcakes. In the bowl of a mixer, cream together butter and sugar. Add vodka, one tablespoon at a time mixing in between. Once your frosting is ready and cupcakes are cool, use a butter knife to spread the icing on in a smooth mound that is higher in the center. Sprinkle each cupcake with white decorating sugar. Place the glass measuring cup in a cold oven, then turn the oven to 275 degrees Fahrenheit. Mix the sugar and cream of tartar in a separate bowl. Heat 1 cup water, the corn syrup and the sugar mixture in the pot on medium heat. Boil the mixture until it reaches 300 degrees Fahrenheit. When the sugar begins to boil, use a pastry brush or silicone brush and a little water, and brush the crystallized sugar off the sides. Don’t put the candy thermometer into the pot until the sugar is boiling. It will take quite a while for your sugar to get to 300 degrees Fahrenheit, but do not walk away or your sugar might burn. The temperature will move very slowly up the thermometer at first until it reaches about 250 degrees Fahrenheit, and then it will quickly jump up to 300 degrees Fahrenheit. Remove your pan from the heat and allow it to cool to 275 degrees Fahrenheit. Do stir it, or add anything until it lowers to 275 degrees Fahrenheit. When it reaches 275 degrees Fahrenheit, add the food coloring and the flavoring and stir it gently. If there is any crystallized sugar on the side of the pan, try to avoid stirring it into to the mixture. Remove the (now very hot!) measuring cup from the oven and pour your even hotter sugar into it. Be very careful. Also- do not pour the hot sugar into your glass measuring cup unless you have heated it first. If you do not heat it the high temperature of the sugar may cause it to shatter. Place the measuring cup back into the oven and let it sit for 5-10 minutes to remove the bubbles. Take the sugar out of the oven and you are now ready to create your ice shards! To make the ice shards we poured out the sugar onto a cookie sheet (covered with parchment paper). Once cooled we broke it into pieces and then chose the best ones . Once your candy ice shards are finished, stick them into the tops of your cupcakes and serve immediately. Easily Entertained Tip: If you are planning to make your cupcakes in advance, keep the ice shards separate until almost ready to serve. 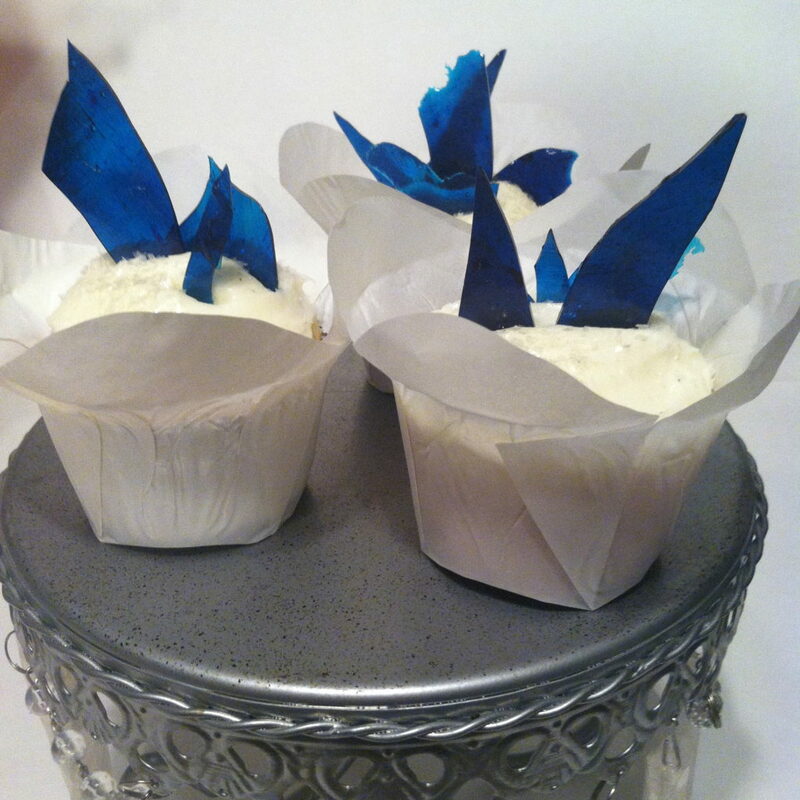 When left over night, the blue color and peppermint flavor stared to melt onto the icing and inside of the cupcakes. The added mint flavor was nice, but the cupcakes weren’t as pretty.